I remember enjoying family trips to Disneyland as a kid, but as a parent my focus changed to making sure my kids were having fun. Last Sunday, I was thrilled to have the opportunity to join my other mom blogger sistahs at a Disney sponsored party for the Silicon Valley Moms Blog. As one of the Partners of the blog, I always enjoy spending time socializing live with the inspiring women (also here, here and here) that I read about daily. And I was looking forward to treating my kids to a Disney experience in their local town. 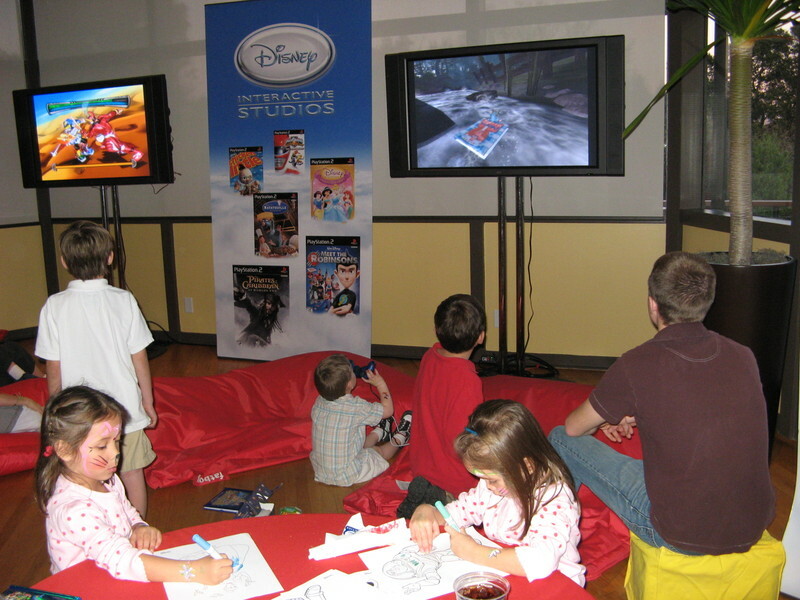 The kids were all excited that their favorite live characters attended the event. My 5 year old twins rushed over to meet Buzz Lightyear – the character that always has a lead role in their imaginary play. The little girls could not stay away from Snow White and everyone wanted to pose with Mickey and Minnie. Best of all, along with a yummy buffet of adult and kids food – they had another room with Disney/Mr. Potato Head pieces to put together (potato bar), castle cookies to decorate, pictures to color and an area with comfortable pillows and video games. My boys and Glennia’s son had lots of fun participating in high tech dueling. I knew there would be something chocolate for me to eat (which usually makes me giddy), but what I did not expect was to feel like a giddy kid about something related to Toy Story. In the entryway to the event, Disney had gift bags and beautiful pictures lining the walkway. At the end was a picture representing Toy Story Mania, a new Disneyland ride coming out Summer 08′ that I had just read about in the New York Times. 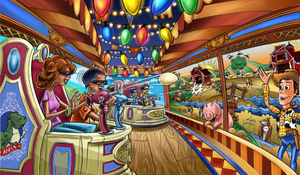 I found the technology behind this new ride intriguing: Using full scale 3-D animation (first for a Disney ride) to update an old fashioned carnival concept with the high-tech elements of a video game. And the article provided some behind the scenes details of how the ride was designed, from digital pictures to foam models to play tests. Best yet, the minds behind the design are not called "engineers" – they are called "Imagineers". As I read the article, I thought, "now that would be a great job!". I felt like a real geek asking the Disney PR folks all about the technology behind Toy Story Mania. "That is so cool" I said, sounding completely like my 9 year old son… Great..
Luckily the Disney folks were gracious enough to offer me the opportunity to interview an Imagineer (here comes the extreme geekiness)… I said "really, OMG, I mean Yes of course I would love to" . And then I started jumping up and down like a kid – something only Disney could motivate me to do. You are so funny! I love that you will get to “geek out” with and Imagineer. I’m with you — interviewing an imagineer would be so cool! I can’t wait to read it.